Ireland is a land filled with true magic. It permeates the earth, promising untold wonders if you will only search just a bit deeper. Lough Gur, in County Limerick, may be the most magical place of all. Red Cellar Cave, the entrance to faerieland. Long before Ireland became the ‘Land of Saints and Scholars’, it was the land of Druids and Celts. Stone age, and later Bronze age, peoples who arrived on the verdant shores and found a place that called to them spiritually. Some of Ireland’s oldest monuments and tombs lie near Lough Gur. As far back as 3000BC, this area has been inhabited by people who left megalithic stone work, great stone circles, early Bronze objects and beaker pottery. 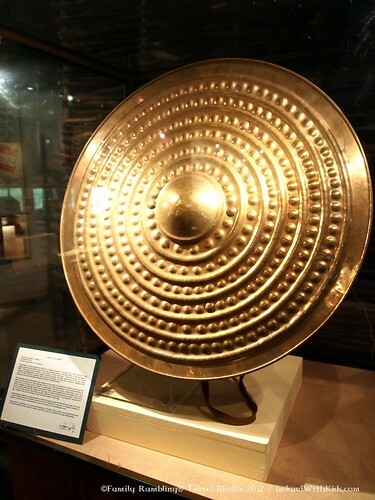 Many of Ireland’s most impressive Bronze Age relics have come from Lough Gur. The best place to begin your tour of Lough Gur is at the Visitor’s Center on the banks of the lough. Stepping through the door of this low, thatch roof building draws you back in time, thousands of years, when the lough circled the island of Knockadoon. Here you’ll see a diorama of what the area may have looked like when first inhabited, a replica of the Sun Shield of Lough Gur and actual artifacts removed from the marshy ground when the lake was lowered. Take the time to watch a quick video of the area before you explore- it will help you better understand the amazing history you will trod across. 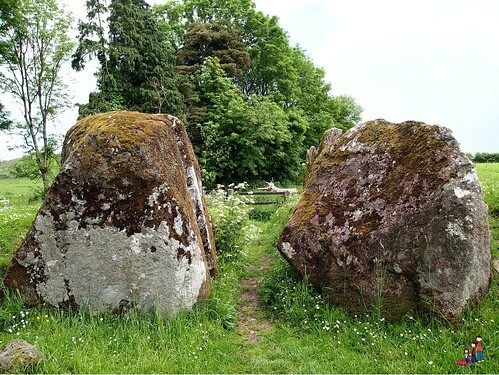 Just down the road lies the Giant’s Grave, a Megalithic stone structure that was used as a burial site for the people of Knockadoon. The nearby “New Church”- built in 1679- is not far from ‘Mass Rock’, where Catholics would meet secretly to hear the Gospels. Entry stones to the Grange Stone Circle easily tower over anyone who enters. 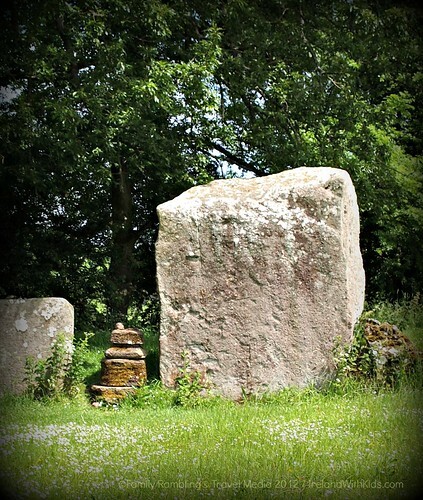 One of Lough Gur’s most mystical places is the Grange Stone Circle. By foot, it is across the lough and over the hill from Knockadoon; a pilgrimage for the lake’s inhabitants, and the many others who came here to worship. Massive entry stones are actually opposite the tourist entry- I recommend a walk around the outside of the circle to enter properly. Directly across from the entry stones is what appears to be an altar, where remnants of broken pottery and small bone fragments have been found. On the ‘offering stone’, which is nearly 5 feet tall, you’ll find flowers and coins. It is dwarfed by Rannach Crom Dubh, the largest stone in the circle. With so much to see, it’s very easy to spend a day at Lough Gur and still miss something. I highly recommend planning to join a guided tour, or arranging one of your own. If a tour doesn’t fit into your schedule, or you prefer self-discovery, be sure pick up an i-Trails map at the visitor’s center or download a .pdf or MP3 before your trip. This is one place you don’t want to visit without plenty of information handy! Weekends and bank holidays 12 noon to 6pm. Admission: Adults €3, children €2. Family tickets €10. Note: Lough Gur is a cash only facility. Plan to spend a full afternoon- if not a day- exploring the wonders of Lough Gur. Lough Gur is an easy drive from Limerick and Bruff. I recommend lodging at The Old Bank B&B. I can’t wait to see all of this!!!.. the farther back into Irish history, the more interesting it is to me… megalithic, neolithic, even paleolithic… of course, Irish history going forward to present day is also of great interest, but give me a stone circle & I’m happy as a lark!.. Then you MUST visit here! It draws me back time and again!